Looking for amazing taste and true flavor innovation? This creative 16 piece assortment of Chocopologie Signature Truffles features all natural premium handmade chocolates from the artisan chocolatiers at Knipschildt in these sought after flavors: white chocolate, milk chocolate and dark chocolate in coconut, caramel & sea salt, classic dark chocolate, peanut butter & jelly, orange creamsicle and strawberry basil. 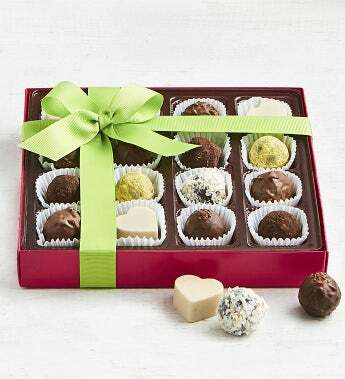 Lovingly assembled in a clear lid gift box tied with a spring green ribbon. Gift Box measures 7.5" x 7.5" x 1.25"